Since I started using SaneBox a few months ago, hardly a day goes by that I don’t empty my inbox and manage emails better. Managing my inbox has never been easy, and I’ve tried all types of solutions, including smart rules and mailboxes and Mail plug-ins. But the subscription-based service, SaneBox, has been the only solution to help me empty my inbox and effectively view and respond back to emails. SaneBox is not a perfect solution, but there a number of reasons you should take advantage of the free trial, especially if your mailbox is typically cluttered and time consuming. Try all features of SaneBox for 30 days, and get $5 towards your subscription. 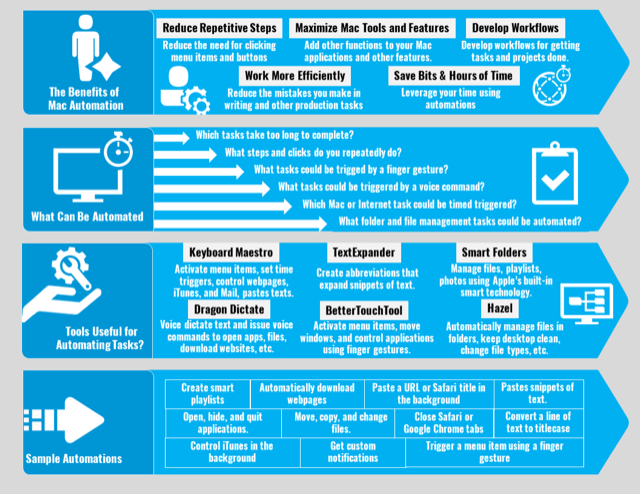 Please use my affiliate link to support MacAutomationTips and the work I do. Thank you. First off, when it comes checking my email, the time tracking application, Timings lets me know that on average I spend about 30 minutes a day in Mail, which includes reviewing, responding, and deleting emails. That’s typically 15 minutes in the morning, and 15 minutes in the evening. At the end of the day, my inbox is mostly cleared out. The goal of using SaneBox is to empty my inbox by the end of the day. That’s done by responding, deleting, or deferring emails on a daily basis. Before I get into SaneBox, I won’t explain how I navigate Mail. Deleting emails is easily done using a BetterTouchTool 3 Finger Click that triggers the menu bar item for deleting a selected email. Typically when I’m viewing and reviewing emails, my hand is already on my trackpad, and with BetterTouchTool I don’t have to bring my hand back to the keyboard to punch the Command+Delete keys to delete an email. I simply click and keep moving. Not only does BTT trigger the menu item, but it also selects the next email for me. Similarly I use a 3 Finger Tap to quickly flag an email, which again prevents me from having to drag the cursor to the Mail toolbar to trigger it. There are a few other BTT hacks I use in Mail, and I will explain them as I describe how I use SaneBox. The following video provides an overview of SaneBox. The video is about 19 minutes, because there’s a lot to cover about SaneBox, but hopefully it will provide you a good introduction to how SaneBox works. 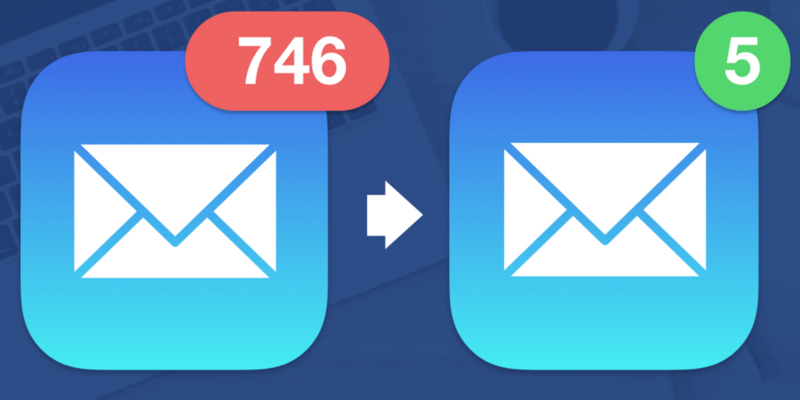 Try to completely empty or Inbox everyday by deleting, responding to, and moving your emails to designated Mail folders/mailboxes. 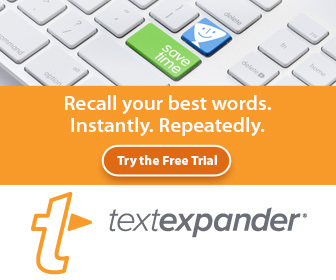 If SaneBox puts some of your emails in the wrong Sane folder, move it to the folder it should go in. For example, if you don’t want an email newsletter to show up in your Inbox, move it to the @SaneNews folder, or the @SaneBlackHole folder, which means SaneBox will delete all future emails from that sender. Limit the use of @SaneBlackHole, and instead manually unsubscribe to as many newsletters that you no longer find useful. If you decide to stop using SaneBox, all yourBlackHole emails will return. You can defer emails to review later by dragging them to one of the following SaneBoxes: @SaneTomorrow, @Sane1Week @Sane3Days, etc. But use these boxes sparingly. Whenever possible, try to act on emails after you view them. Use the SaneReminders feature for the exact day you want to have an email sent back to you. After you forward an email to SaneBox with a designated date and/or time, you can delete that email and a copy of it will show back up in your inbox based on the time you set. If you decide to the subscribe to SaneBox, you might want to go with the basic plan first, and see how much you’re using it before upgrading to the next level. Choose the annual subscription, which saves you 30% over the monthly subscription options. The following screenshot is a snapshot of stats about my Mail usage. As you can see, I try to keep my Inbox to zero as much as possible. I may leave a few emails in there at the end of the day because I will respond or use them the next day. I’m not sure how SaneBox calculates my timed saved, but I do save time, but more so I declutter my Inbox and keep most of my emails managed in folders, which is a time saver. 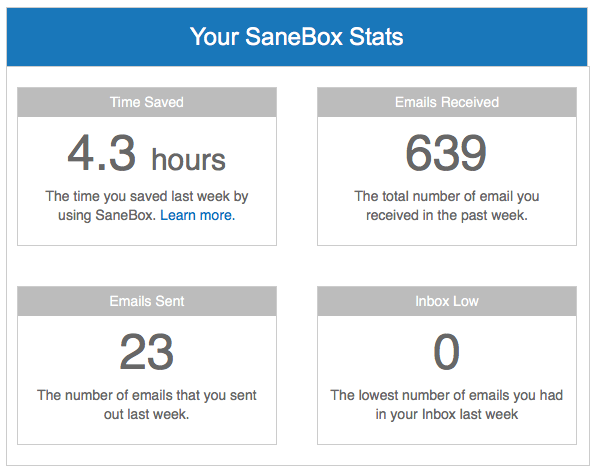 I still get about 60-80 email newsletters a day, but SaneBox has helped me reduce that number by half. Because SaneBox filters all the emails that it thinks are newsletters into one folder, that helps me see which ones I want to keep and unsubscribe to. I scan my @SaneNews folder everyday, read or save the emails I want to keep, and then use a BetterTouchTool finger gesture to quickly select all remaining emails and delete them. Both of those steps are done in one click. Emails that I don’t delete get moved to one of my iCloud mailbox folders. 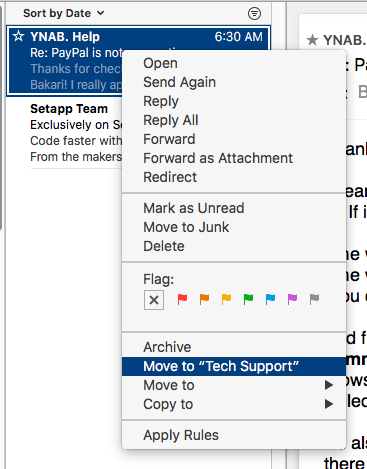 I have about three dozen folders, and by simply right-clicking the email, I can select the move it to a folder in the contextual drop-down. 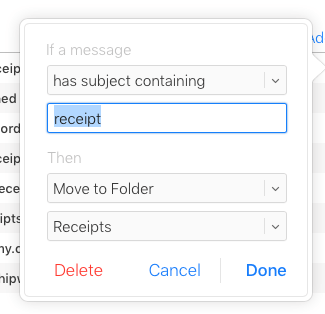 Mail remembers where you previously moved an email from a particular sender so that next time you want to move an email from the same sender, the folder path automatically appears in the drop-down. In order to quickly defer emails, I’ve dragged an alias of some of the folders I use the most to the favorites bar of Mail so I can more easily drag a selected email to one of the designated folders. SaneBox acts on emails when they arrive in your iCloud box. If you want Mail smart rules to work using SaneBox, it’s better to set up those rules in your online Mail iCloud account, instead of in your local Mail client. To do this, log into your iCloud account > Mail, and then click on the gear button at the bottom left of the page, and click on Rules. Rules in iCloud are not as advanced as in the desktop Mail client, but they are still useful for managing and organizing your emails across all your devices. I’m not always fond of paying a subscription for an online service, but when I see that a service is making my daily tasks easier, I don’t mind subscribing. However, there are other solutions with perhaps fewer features, such as the mail client, Newton, that includes features for snoozing emails, pulling back sent emails, and filtering newsletters. I haven’t had a chance to try Newton, but for now I’m very satisfied with how SaneBox works and helps keep my Inbox clean. I would love to get your questions and feedback about the service. Try all features of SaneBox for 30 days, and get $5 off your subscription. 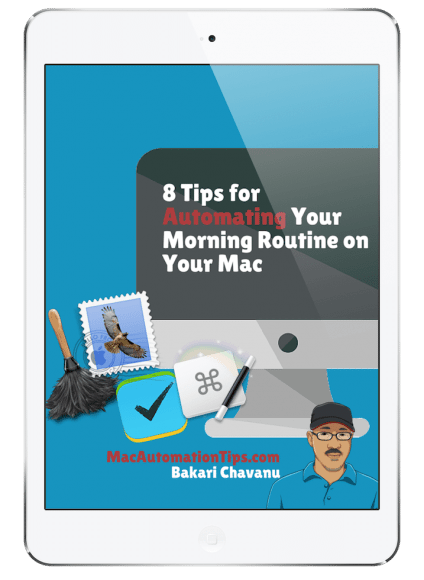 Please use my affiliate link to support MacAutomationTips and the work I do. Thank you.